In order to develop new domestic production of Rhei Rhizoma (RR) from Rheum specimens cultivated in the Sugadaira Medicinal Plant Cultivation Test Field (SMPCF), the ITS sequences of 12 SMPCF specimens and Chinese Rheum specimens of four species, as well as RR samples produced in North Korea, China and Japan, were determined by subcloning and their sequences were compared. As the ITS sequences of 10 SMPCF specimens showed significant intra-individual polymorphism, identification of pseudogenes was conducted by detecting the three motifs of the 5.8S sequence and the stability of the 5.8S secondary structure. Approximately 46% of sequences obtained from the SMPCF specimens were putative pseudogenes. The maximum likelihood tree based on ITS sequences showed three main groups—the outer group and inner clusters I and II; clones from 10 SMPCF specimens including putative pseudogenes belonged to the outer group. Cluster I was composed of two clades, one including clones from R. officinale specimens and R. palmatum-derived samples with matK genotype Rp9, and another including clones from R. coreanum-derived samples. Cluster II consisted of three clades, one including clones from R. palmatum specimens with genotype Rp5, another including clones mainly from R. tanguticum specimens with genotype Rt4, and the third including clones from R. palmatum or R. tanguticum specimens with various matK genotypes. Clones from SMPCF specimen RC5 showed a close relationship with those from R. tanguticum specimens with matK genotype Rt4, whereas those from specimen RC9 related to R. coreanum-derived samples. As a result, specimens RC5 and RC9 were considered as candidates for the development of domestic RR. The online version of this article ( https://doi.org/10.1007/s11418-019-01298-4) contains supplementary material, which is available to authorized users. 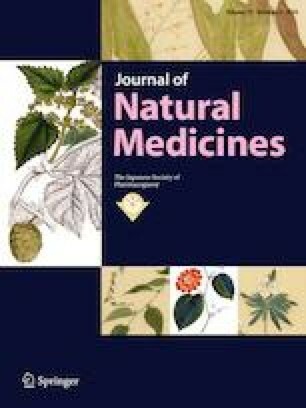 The authors would like to thank Mr. Morikazu Murakami and Mr. Takayuki Tamura of the Medicinal Plants Center, Toyama Prefectural Institute for Pharmaceutical Research, all the staff of the SMPCF and Dr. Shengli Wei from the School of Chinese Pharmacy, Beijing University of Chinese Medicine for helping in sample collection. This work was supported by the Research on Development of New Drugs from Japan Agency for Medical Research and Development, AMED [Grant number JP16ak0101034h0002, JP17ak0101034h0003] and in part by 2017 Director Leadership Expenses, University of Toyama and JSPS Core-to-Core Program, B. Asia-Africa Science Platforms.